How to make amazing coffee at home, even if you’re cheap and lazy. It’s possible to care about how your coffee tastes without making your whole life about coffee. You don’t have to go to a fancy coffeeshop for good coffee. You can pour-over at home. But if coffee is something you drink every day—perhaps multiple times a day—why shouldn’t you want to learn how grind size affects extraction from a coffee bean? Why should paying attention to such a detail be regarded as any more annoying a habit than having the patience to remember to preheat an oven, peel an onion, or perform any of the sundry other preparatory tasks that we endure in order to improve the taste of products we intend to ingest? The answer has to do a lot with access to knowledge about coffee and comfort with being seen as pretentious—both of which work overtime as markers of class. Today’s elite roasters don’t do much to undermine popular conceptions about coffee connoisseurship: note the dandified presentation that appears to be mandatory for Stumptown baristas, or the very name of Intelligentsia Coffee. But that’s all marketing, which a person can—and often should—choose to ignore. Coffee evangelists also undermine their own cause by making the brewing process appear too fussy. The New Yorker’s Kalefa Sanneh memorably narrated his own personal practice (“If you are staying in a B. & B., you can barge into their kitchen and insist on making coffee with your own gear”). Slate’s June Thomas profiled a champion barista with a “meticulous attention to detail” (“I write down how much coffee I’m using, how much water. I take a record of the time it took to brew, of the grind size. And then if I don’t like it, I change one variable each time.”) Just last month, Wired’s Mat Honan offered his “Coffee Essentials for the Perfect Cup,” to the tune of $509 (and that’s before beans). I suspect that many readers of such detailed, information-rich items may experience them as further evidence that artisanal coffee appreciation requires too much investment of time and money. All of those articles have useful information in them, but their proud precision makes them not-at-all persuasive introductory guides for the uninitiated. Here’s the truth: You don’t have to be a champion barista (or aspire to be one) in order to dramatically, and quickly, improve your at-home coffee process, nor do you need to spend $500 on equipment. You can acquire a few pieces of basic gear, order beans directly from one of the best roasters working today, and immediately begin making coffee at home that’s many times better than what’s being served at Starbucks or your local price-inflated but barely serviceable café. And the per-cup price is better, too—such that, just a few weeks into your new at-home process, you’ll have recouped the costs of your initial investments. 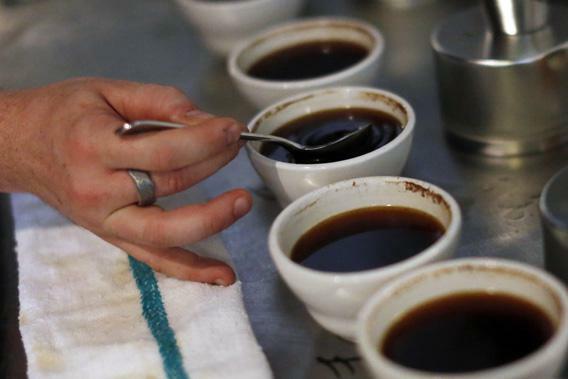 What follows is a crash course in being a B+ coffee snob. Or, if we decide to divorce any and all associations of taste-distinction from snobbery (as I think we should), we could call this a guide to having better coffee without making your whole life about coffee. The only moderately expensive piece of unfamiliar equipment you will need to acquire is a conical burr grinder, which grinds beans finely and evenly (as opposed to a disc grinder, which tends to chop them in half once and call it done). Apart from that, you’ll need to acquire a dripper, a server (a glass carafe with measurement lines on it), and, if you don’t have one already, a digital kitchen scale (preferably one you can “zero-out” after placing a small cup on it, which is what you’ll put the beans in as you measure). You really do need this stuff, because you won’t get the full benefits of a coffee’s flavor unless you’re exact about the weight of your beans and the volume of your water. Estimating the weight of grounds—and being wrong by half a gram on either side—is what most often accounts for sourness or bitterness. (Different kinds of beans can be different sizes, so you can’t just scoop by volume.) And letting too much water pass through the filter is how overextraction (which muddles or obscures coffee’s taste) happens. Is this starting to sound complicated? Rest assured that when you get it down, the process for making a 12-ounce pour-over cup of coffee takes about six minutes total—beginning when you set your kettle of water on a burner and ending when you take your first sip. It might not be quite as fast as dumping an inaccurately measured pile of coffee in a drip machine, pressing “start,” and waiting for the machine to burble its way to a haphazardly-extracted full pot, but it’s pretty close. And it takes way less time than going to your local café and waiting in line behind picky people placing complicated latte orders. It’s cheaper, too. I used to burn through $10 a day, during an average freelance-writing shift, on burnt-tasting café coffee. When I decided to start making coffee at home, I spent about $125 on the equipment listed above. Of course, the best equipment in the world is useless without good beans. I’m a Stumptown person, in part out of loyalty to my Portland, Ore. heritage, and in part because I can buy them locally in New York. Their cheapest beans—which are uniformly excellent—run about $16.50 per three-quarter-pound bag, which yields around 10 12-ounce servings. That makes large coffees that are about half the price that they normally go for in my north-Brooklyn neighborhood. It took about two months for my equipment to pay for itself. You certainly don’t have to limit yourself to Stumptown’s basic beans, though. Becoming a B+ coffee snob will let you take advantage of the renaissance that’s going on right now with roasters. (Heart, Coava, and Sterling all deserve mention.) Suddenly, amazing, nuanced coffee flavors you never knew about will become accessible to you: the varieties of chocolaty goodness in Central and Latin American cups, the tart and spicy inflections of African coffees, or else the oddly savory and sometimes tea-like profiles of Indonesian-sourced beans. The tasting notes may sound a little pretentious, but they’re not incorrect. When the notecard that comes with one of Stumptown’s current hits—Indonesia Sulawesi Toarco Toraja—promises “sweet and juicy notes of red currant and plum coat your palate in a cup with the taste and texture of molasses,” that’s actually pretty on the mark. But the only way to bring these flavors to the fore is to weigh your beans, grind them finely, and add water carefully. Measure out 34.5 grams of beans on a kitchen scale, and grind them finely in a conical burr grinder. Put a No. 4 filter (I use Melitta) in a dripper sitting over a server. When the water comes to a boil, pour a little into the dripper to wet the filter, then discard the water that collects in the server. (Keep the kettle boiling.) Replace the dripper, and add the ground beans to the filter. Pour less than ½ cup of just-off-the-boil water over the coffee. Don’t pour so fast that the grounds start rising up the sides of the filter. (The idea is to let the water “wet” the grounds, unlocking flavors, in preparation for the bigger hot-water hit to come.) About 30 seconds later, pour in enough water to let the grounds rise three-quarters of the way up the filter, while breaking up any visible clumps of coffee on the surface by shaking the kettle a little. About 45 seconds later, repeat, letting the grounds rise up no higher than they did on the first pour. When the coffee hits the 12-ounce mark on the server, remove the dripper, drink your coffee, and get on with your day. That’s it! The first cup is not going to be the best one you will ever make, but it will taste excellent compared to the swill you’ve been using to kick off the day. After a few test runs, the choreography will become second nature. At this point in the morning, I’m more likely to trip over my own feet than to overextract my coffee. The best thing about B+ coffee snobbery is that it is customizable. You’ll experiment to find your own pour rhythms. Maybe underextracting slightly is your thing, or going finer on your grind. (Bitterness and sourness are in the taste buds of the drinker.) But most importantly, you’ll get dependably better tasting coffee, without the project taking over your entire life.